Every wise man should know that material objects do not remain as they are, as time and days will pass by, i.e. any material object whether it is a stone, iron, wood or any living body like those of animals or man etc. ; it will – inevitably – be destroyed and broken up; even though it is the strongest or the hardest body; e.g. we know that iron is hard and solid, but in spite of its hardness, it is quickly oxidized, so that if we bury a piece of iron under the ground, then after one year we shall find it eroded and rotten and become like dust. Another example: If we take a stone and heat it, it will disintegrate and become like dust whatever hard it is. As such is the human body; for it is going to become old, then it will be destroyed whatever his life is long. Therefore, material bodies at last will be destroyed and will disappear. I.e. (Whosoever upon the [earth] shall perish. The interpretation: The material (or mortal) life has an end, and every material (or mortal) object or body upon earth will disintegrate and vanish. So the Arabic word فانٍ i.e. (shall perish) indicates the ‘vanishing and perishing’. Every material object will vanish, while every ethereal living structure will survive after its transfer to the neighborhood of its Lord. The interpretation: Its parts will disintegrate and vanish away, while every ethereal one will survive; i.e. everything at your side and [neighborhood] is a mortal and dying, but that which is at His side [or neighborhood] does not die. for the sun will crack and will become many planets, and the planets will break up into meteorites, and so on the solar system will break up and a new sun will appear which will attract those broken up pieces around it, and a new solar system will thus be formed. Then when the life of that new sun will come to an end, it will also crack, and its solar system will break up, and another system will issue instead of it and so on. In the following pages, we shall mention the destruction of each of the celestial objects of our solar system, in details, with quotation of the Quranic revelations and logical proofs; and the success is granted by God Most Gracious. We have said that the Earth rotates around itself so that the day and night issue, and the cause of its rotation is the heat present in its core. Obviously, this heat will not last forever, but will finish and the Earth will gradually cool little by little in the course of time, just as had the Moon cooled and stopped its rotation around itself. and the second is the large amount of particles and meteorites that fall on it from the space; so that its cold crust will increase, and it will stop its axial rotation. Then there will be no interchange between the day and night, but the night will be everlasting till Doomsday; because the side facing the sun will have an everlasting day, that no night will succeed, while the side – that is not facing the sun – will have an everlasting night that no day will succeed. I.e. (Say [O Mohammed, to them]: "What's your opinion: if God makes for you the night perpetual [without being succeeded by any day] till Doomsday, who is a god other than God who could bring you [day] light? Will you not [then] hear [the wind and the falling of the snow?]" § (if God makes for you the night perpetual [without being succeeded by any day] till Doomsday) indicates the side which will have an everlasting night. § (if God makes for you the day perpetual till the Doomsday) indicates the side which will face the sun. I.e. (And by the night when it will persist! And by the morning when it will come forth! >> (when it will persist) means: when it shall be fixed in place and its duration shall be prolonged, i.e. it shall be everlasting till Doomsday. [This is an oath]: By that long night when it will remain as it is, and by that long day when its morning shall appear and be clear of its night. This, actually, is a threatening oath by the torment of that day and that night. So, the ‘sunset redness’ is the zone intermediate between the day and the night. I.e. ([I swear] by the severe heat of [the region of] the noon-time! And [by] the night when it shall be ‘quiet and everlasting’! The word غسق in Arabic means the dark night in which no moon is shining. It means: that long night which will be in the last period of the World; for God – be exalted – commanded His prophet to ask protection of God from its evil. In that last day, the angels, the pious and the righteous will ascend up through the sky to the heavens, and none shall remain upon the earth except infidels (or disbelievers), wrong-doers and criminals. The Earth will cease to spin around itself, and that will last one thousand years [of our years], then Doomsday will take place. The “am’r” is an indication of the spiritual creatures. It means: The angels are ordered to descend from heaven to the earth, then shall ascend to Him in a day, the duration of which is one thousand years. Their ascension will be to the ethereal heavens. Ethereal creatures will leave the earth; because the torment and punishment will afflict the earth dwellers on that day. It means: a day lasting one thousand years, prepared for their punishment. The planets will not come to a standstill, altogether and simultaneously, from spinning around themselves. But this will gradually take place; so that the smallest one among them will be the first to stop its spinning; then the planet bigger than the first one; then the bigger and so on till the last of them. For example, Mercury is the smallest of the planets in volume; therefore, it should stop before the rest; because the heat of the small object will finish before the big one. After that, Venus will stop because it is bigger than Mercury. Then Earth, because it is bigger than Venus; and so on the last of them to stop will be the biggest of them in volume. 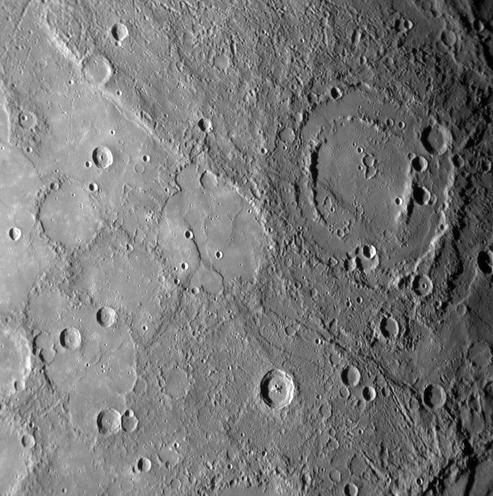 So Mercury had stopped its axial rotation or spinning in the past. Then the Earth will stop its axial rotation 1000 years after the stopping of Venus. Then 500 years following the stopping of Earth from rotation, Mars will also stop its spinning. Doomsday will take place 500 years following the stopping of Mars from its axial rotation. Therefore, Venus will continue its stopping from spinning for 2000 years and Doomsday will happen. Earth will keep without spinning for 1000 years and then Doomsday will occur. Mars will keep stopping from axial rotation for 500 years and then Doomsday will occur. Hence, we can realize the future standstill of Earth, from the standstill of Mercury and Venus; if we find that Venus does not rotate around itself, then we should know that the turn of the Earth is coming, and the torment will afflict its inhabitants. I.e. ([I swear] by [the zone of] the dawn! And by the ten nights [preceding the standstill of the earth! And as such are the ‘ten nights’; for they will take place when the central heat of the earth will decrease, so that, at that time, its rotation will be very slow; so that the duration of the day will be three months, and the night – too – will last three months. Therefore, when ten of such long nights will pass, the earth will stop its rotation because its central heat will finish. At that time, the duration of the day will be one thousand years; and similarly the night [in the other side] will be. After that, Doomsday will take place. >> (And by the even [: the two planets: Mercury and Venus] and the odd [: the planet Mars! ]): the ‘even’ is an indication of both Mercury and Venus; because they will stop before the Earth; because their heat will finish before the finishing of that of the Earth. For this reason, God mentioned the ‘even’ before the ‘odd’, while it is expected that the odd is to be mentioned before the even. The ‘odd’ is an indication of Mars; because it will stop after the Earth. The ‘night’ is that long night which will last for one thousand years, and (when it will spread) means: when it will be transmitted to Mars, or when it will spread to Mars; like their saying: The disease is spreading among people, means the infection is transmitted among them from one person to another; this infection comes from Mercury to Venus, then to Earth and then to Mars. As there will be a long night in the Earth, likewise – in Mars – there will be a long night. So when the night in the Earth will have lasted one thousands of our present years, the Sun – at that time – will break up, and Doomsday will take place. This is a threatening oath. You will see, O inhabitants of the Earth, what punishment and torment will afflict you, when it will stop its rotation, and the position of the dawn will be intermediate between the night [zone] and the day [zone], and ten long nights will cover you, that will awaken you from sleep, due to the torment and punishment that will afflict you during them. And just as how Mercury and Venus had stopped their rotation, and their inhabitants had been afflicted by chastisement, the same will also afflict the Earth inhabitants. Then this disease will spread to Mars, so that it will stop its rotation and its inhabitants will be afflicted with the same torment afflicting the Earth inhabitants. Then what are you going to do on that day? Who will save you from God’s chastisement when it will take place? >> (Will this [threatening and warning] be enough as an oath for a rational man?) i.e. is there, in the oath just mentioned, a convincing for any wise man, so that he will believe firmly in the oneness of God [: that He is One, according to the First Commandment], and the truthfulness and honesty of Mohammed [and that he did not lie]? And will this warning be enough as an advice to anyone who may accept the advice and a sufficient bidding for a rational man? In frequent occasions, some spots appear [every now and then] on the surface of the Sun, which remain visible for few days then disappear. Astronomers have seen these spots, as had some people seen them in the ancient times and started to give different explanations. One of such explanations is that Sun has become old, and these spots are part of the solar body that fire did not find fuel to consume! “The earliest time the sunspots had been seen was at 321 AD, and were mentioned in the Chinese history. The Arab, too, were aware about the spots in the ninth century, and that was at 807 AD; they were very big and were visible for more than one week. But none of astronomers was interested in studying them until 1610 AD, when the telescope was invented; the scientist Galileo was the first one to observe them with the aid of the telescope. Few years ago, a spot appeared and was visible for two weeks: from 28 Jan. to 10 Feb. Evidently, from its observation, its length was 112,000 miles: a distance that equaled 14 times the radius of the Earth; its width was 63,000 miles, and its area was 3,500 million square miles, i.e. 108 times bigger than the area of the Earth, and 1445 times that of the Moon. The appearance of spots is usually accompanied by a magnetic field disturbance that can be detected by astronomical observatories. (1) They disappear after few days when they will not be seen [afterwards], because the sun has swallowed them. If, really, these spots were due to the putting out of the sun, then they must increase a day after another until all the surface of the sun will be put out, when its Doomsday will take place. (2) These spots are not seen by people at the present time only, but people saw them in the ancient times, when the astronomers observed them, as it is mentioned in books and history. >> The sunspot is less in temperature than the rest of the sun surface. 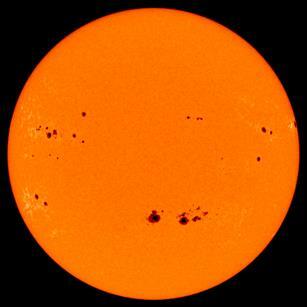 >> These spots are darker than the rest of the sun surface. The genuine reason for the future putting out of the sun is the large number of the meteorites and cosmic rocks swallowed by the sun, so that its density will increase and its surface will cool leading to the formation of an earthy crust. Most of the meteorites and cosmic rocks are obtained when one of the planets of this sun comes to a standstill; that is because meteorites, celestial rocks and moons are attracted to planets, and when the planet will be depleted of its central heat, it will stop its spinning; for the same reason, its gravity will be lost; because the gravity is the result of the central heat of the planet. At that time the meteorites, celestial rocks and moons attracted by that planet will move towards the sun by its gravitational force, and the sun will swallow them. (3) The time required for the putting out of the sun is not more than two thousand (of our) years, after which the sun will become an earth with a cold crust. The indication of that is what has been mentioned, in the past pages, about the formation of our Earth; for it also had been a sun which became an earth after the end of its life, and its surface became cold, and that process lasted two thousands of our years, then it burst and became nine planets. The same fate will be of our sun, which will be put out, and its surface will become cold in two thousand years, after which it will burst and break up into nineteen pieces. The ‘two days’, mentioned here, means two thousands of our present years; and the ‘creation’ means the transformation; i.e. He transformed it into an earth after being a sun. This Quranic revelation has been interpreted in the subject of the Formation of the earth. As regards what was mentioned in some newspapers about the large sunspot observed few years ago, and remained visible from Jan. 28 to Feb. 10 /1956; undoubtedly, it was a group of meteorites which had been revolving around Venus [? and its moon, in case it had one in the past – The translator]. This Venus had been depleted of its central heat, and it had lost its gravity, so that these meteorites escaped the gravity of Venus and were drawn by the gravitational force of the sun, which swallowed them in 2 weeks. Some newspapers mentioned that both Mercury and Venus have stopped their axial rotation, so that their day and night have become everlasting. 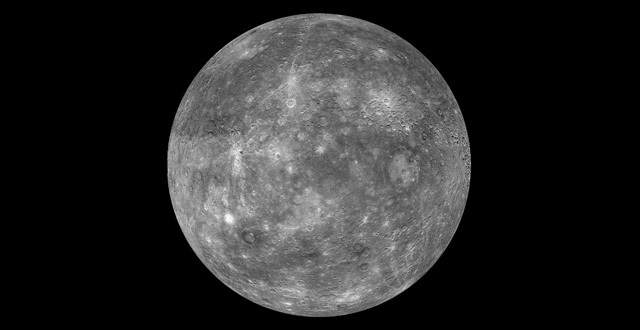 “We mean, by “the Scorched World”, the planet Mercury; for it is the nearest planet to the sun; it is only 50 million km from the sun. It completes its revolution around the sun in 88 days which is the length of its year. It faces the sun by one side only, so that it keeps the same face towards the sun, like our Moon in relation to the Earth, therefore its temperature reaches to about 400° C ; i.e. four times the boiling degree of water, which also is more than the melting degree of lead and bismuth. Later on, it was mentioned in an Arabic book entitled ‘Geographical Contemplations’ by Reshied Rushdi, that both Mercury and Venus had stopped their axial rotation, so that both their day and night had become everlasting; that was under the title of ‘A Perpetual Day and Night’, page 160. 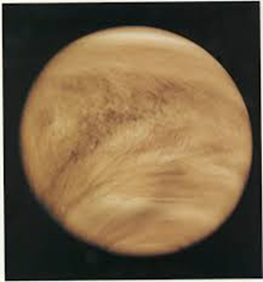 I say: the standstill of Venus from its axial rotation is a clear indication of the approach of Doomsday; because the putting out of the Sun will start from the time of the cessation of Venus from its axial rotation; that is because of what the Sun obtains of the meteorites and meteoritic rocks belonging to Venus. Following Venus, the turn will be for Earth to stop its axial rotation; due to the coldness of its core, then the meteorites and Moon will escape the gravity of Earth, so that Sun will pull them by its gravitational force and swallow them. After [Earth,] the turn will be for Mars to stop its axial rotation, so the Sun will pull its meteorites and moons, by its gravitational force, and swallow them. The meteorites and celestial rocks belonging to these three planets, just mentioned, will be sufficient for putting out of the Sun and cooling of its surface, so that the Sun will become an earth with a cold crust. This process will be accomplished after elapsing of two thousand years, as we have explained; i.e. the Sun will burst after elapsing of two thousand years, and its Doomsday will take place; this can be calculated from the time of the cessation of Venus from its axial rotation … to the day of the break up and disruption of the solar system. As regards Mars, its standstill will last five hundred years; that is because Mars will come to a standstill after the standstill of Earth by five hundred years; therefore, its standstill will last five hundred years. Earth will stop rotation for one thousand years, while Mercury will last more than that. The First: the cooling of its core; that is by the emergence of fire and gases from the core of the Earth because of volcanoes and the extraction of Petroleum for the advantage of people; so the cold crust of the Earth will increase in thickness while the central heat of the Earth will diminish. And as we said that the gravity influences the cold object more than the hot one; i.e. the more cold is the object, the more will it be attracted towards the Sun by its gravity and vice versa. The Second: As much as the Earth’s central heat will diminish and its crust will increase in thickness, the more it will contract and get smaller and its cold crust will crack and contract; so that the longitudinal mountain ranges will form; and as we said that the smaller the object is, the more will it be attracted towards the Sun. Therefore, the Earth’s central heat has diminished, due to the large number of volcanoes and the emergence – from its core – of fire and gases, and its surface has contracted, so it has become smaller in volume; and because of all that it has become nearer to the Sun. Likewise will the rest of the planets be: whenever each planet among them becomes cold, it will get nearer to the Sun. When these signs will take place, like the occurrence of the evening-glow (or the sunset redness) and the everlasting night and what beasts it will round up; at that time you will ride up the planes or layers of the atmosphere: a layer after another, so that you will rise up and get nearer to the sun; i.e. Earth will take you: mounting with you the layers of the sky: one layer after another. Logically, when the Earth will approach the Sun, then the Sun heat will influence it more, so that it will get much greater solar heat than that it was getting before. Moreover, its standstill from rotation will lead to the heating of its surface; because the solar heat will be uninterrupted, that is in the hemisphere facing the Sun, while the opposite hemisphere will be bitterly cold; because it will get nothing of the Sun rays, and they will not have any day till Doomsday. Then, obviously, the inhabitants of that side will have a hard life, will suffer and have pain and torment; because the life of man and animal is dependent on sun rays without which there will be no plant or animal. As regards the day-side inhabitants: they will die from the severe heat. But [the inhabitants of] the zone intermediate between the night and the day, i.e. the zone of the evening glow (or the sunset redness); they will be in a better condition than the rest. · (There isn’t any city) means: There isn’t any city or town that may escape the destruction or the chastisement. · (but We are going to terminate its [people with heat and thirst]); He means by that: those in the day-side; because they will die from the severe heat. · (or chastise its [people]); He means by that: those in the night-side; because they will suffer from the coldness, starvation and disease. The torment and punishment will afflict them, because of being disbelievers, infidels and sinners; while believers will ascend up to the heavens on that day, together with the angels, and no believer will stay on the earth surface. I.e. (Say: "My people, work as much as you can [against me and my companions], for I [too] am working [according to the command of my Lord]; thus you will come to know. Upon the day when the sky will violently heave. When that heat will result after the standstill of the Earth from its rotation, at that time the plant will burn, trees will dry, rivers will dry up and the water of seas will evaporate, so that there will not remain any water, seed, fruit or animal; that is on the day-side; because the Sun will not let anything available for them afterwards; so that they will die from heat and starvation. >> (if your water sinks away [deep in the earth]) means: it will sunk and disappear into the earth; He means by that the wells; because there will only remain for them the underground unwholesome water; i.e. they will have only the salt and bitter deep wells. >> (who can then provide you with flowing [palatable] water? "); i.e. sweet and wholesome water for drinking, and that will be when your [surface] water will evaporate and vanish into the space. (When fetters [were] on their necks, as also chains, as they were dragged. I.e. (We have made what [plant, animal and man] is on the earth an ornament thereof, to try them: which of them is acting best. The word صَعِيد is the land on which there is soil and stones, but having no plant or trees. The word جُرُز is the land to which water does not reach, and is devoid of plants. I.e. (Have they not seen how We drive the water [in the cloud] to the dry land [devoid of the plant], and therewith produce crops whereof their cattle and [they] themselves do eat? So the interpretation of the preceding Quranic revelation 18: 8 is: We shall make it a dry land without plant or trees; because they will burn by the sun heat. I.e. (1- Have [you, Mohammed, understood] the account of the overwhelming [sky, when it had been] conveyed to you [in a previous revelation 44: 10-11]? 2- On that day, [many] faces will be humble. 5- Shall be given to drink from a very hot [and temporary water] spring. 6- They will have [in the world of souls, after their death] no food save from [some kind of] thorn. I.e. (But watch [O Mohammed] for the day when the sky will bring obvious smoke. The meaning of the ‘overwhelming’ is that which will overwhelm, envelope or cover people by its evil; and it is the gaseous layers that will mix with each other to become a thick smoke: consisting of seven gases and causing suffocation. >> (On that day, [many] faces will be humble.) They are the associaters [i.e. those who ascribe other gods or rivals with God], and the guilty or sinners who will stay on the earth after it will stop its axial rotation. >> (Toiling and laboring hard [in the life of the World: not for God, but for others.]) They will toil with digging the underground tunnels to protect them from the burning heat of the sun, and with digging the wells to drink from their water. >> (Broil in a very hot fire [in the Next Life. ]), which is the heat of the sun that will increase on the day-side. It means: They will drink water from a very hot spring for a period of time, then its water will finish, so that they will turn to wells for drinking water, because the water of rivers and seas will evaporate by the sun heat, until no water will remain for them to drink, even the bitter and salt water of wells. I.e. (Say: "Have you considered: if your water sinks away [deep in the earth], who can then provide you with flowing [palatable] water?") means: If your water sinks into the earth, and you drink from wells. We said that Moon orbits around the Earth, and because of that it becomes a crescent, then a full moon, then it returns to be a crescent. We said also that its orbiting or circling is because of the spinning of the Earth around itself. Then, logically, if the Earth stops its spinning after the deprivation of its central heat, then the Moon, too, will come to a standstill [from circling around the Earth], so that it will remain as a full moon always, and it will not return again as a crescent ; because its lightened face will be towards the Earth, and will remain as such for a limited time after which it will be pulled to the Sun by its gravitational force; because the heat of the Earth will not finish suddenly, but gradually; and it will come to a standstill before will its central heat finish completely; and the little amount of heat remaining in the core of the Earth will be enough to hold the Moon fixed in its place. Therefore, the standstill of both Earth and Moon will be at the same time, and when the Earth heat will completely finish, then the Moon will be cleft apart into two halves; because the compaction of any object is by the gravity. The Sun will still be present after the cleavage-apart of the Moon; and because it is an attracting object, it will start to pull the Moon towards itself by its gravitation. So the Moon will stop its revolution at first, then it will cleave apart, then it will be pulled towards the Sun. The Arabic word اتَّسَقَ means: the Moon completes its phases until it becomes a full moon. We said that if any attracted object escapes the gravitation, it will be destroyed if it is a big one, i.e. it will be broken up into pieces. But if it is a small one, it will be halved by fission. Now, the Moon is attracted to the Earth, so if it escapes the gravitation – after the deprivation of the Earth heat – it will be cleft apart and become two halves, and will remain as such for a limited time, then it will be pulled towards the Sun by the gravity of the latter. The moons of the rest of the planets will have the same fate. >> (The hour [of their death] has become imminent) means: the hour of their death has approached and become very near; and We shall punish them for their stubbornness and mocking. >> (and the moon was detached [from the earth in the past, and will split into two halves in the future, before Doomsday]) means: the moon had cleft and parted from the Earth in the past, i.e. detached from it, and it will also cleave when Doomsday is nearby. If We show them, nowadays, one of Our portents [or miracles] like the cleavage of the moon, or the other signs which they have demanded, and they see it with their own eyes, then after all, they will not believe in you, Mohammed, because of their stubbornness; but on the contrary, they will go astray, away from you, and will say: it [: the Quran] is merely a magic, and will go on saying that the Quran is a magic. >> (So when the sight becomes dazed) means: when the sight is in horror and perplexity for what it sees of the portents of Doomsday; that which he denied before. >> (And the moon is cleft [into two halves.]) The Arabic word خسف means the calamity which afflicts a man and destroys or hurts him very much, or afflicts a house and crushes it. >> (And sun and moon are joined together.) That is because when the moon will escape the earth gravitational force, then the sun will draw it towards itself, and it will unite with the sun. I.e. [I swear for the future] by the sun and the severe heat of its noon-time! It means: when the moon follows the sun, and be attracted to it. We said that the earth gravitational force is the result of its central heat. However, this heat will finish; then, at that time, the meteorites and meteors will escape its gravitation; likewise, will the moon do. As a result of this, the sun will draw the moon and the meteorites by its gravitational force. >> (On the day when [the earth will stop its axial rotation] We shall move the mountains) means: We shall move the meteorites towards the Sun. The interpretation: On that day the meteorites will move towards the Sun, in swarms like the sand-grouse swarms. It means: the meteorites will be moved towards the Sun. I.e. (Upon the day when the sky will violently heave. The interpretation: The meteorites shall move towards the Sun. We said that seven gaseous layers are above the Earth, and that the Earth will stop from rotation, when its central heat will finish. When all this will take place, then the order and harmony will be disturbed; so that every moving object, attracted to the Earth, will stop its movement; and every stationary thing, belonging to the Earth, will move. Therefore, while – nowadays – the gaseous layers are calm, stationary and not reeling, then they must be disturbed on that day, and they will reel about and heave; because the Earth is approaching the Sun, so that the standstill of the Earth, and the Sun heat will reverse the harmony of those gaseous layers; so that they will be disturbed and reel about, until they will mix with the air [i.e. gases of the upper atmosphere will mix with gases of the lower atmosphere – The translator.] so people will become ill – because of these gases – and they will be suffocated, which will lead to the death of large numbers of people. The interpretation: The ‘heaving’: is the swaying to and fro. >> (save with His leave); this is an exception. It means: until before Doomsday; because God – be exalted – will permit it to fall on the earth [at that time], and the word ‘sky’ means the gaseous layers. Then at that time the way to repentance will be blocked; and the repentance of every infidel, disbeliever and wrong-doer will not be accepted. I.e. (On the day [that] one of your Lord's portents will come, it shall not profit a soul to believe [at that time] that never believed before [the occurrence of that portent], or earned some good by his belief. The ‘portents’ means the miracles which are the extraordinary events. That is because Quraish asked Prophet Mohammed to do some miracles or extraordinary events; therefore, this Quranic aya was revealed. then the fixation of the moon, then its fission, then its attraction towards the sun by the gravity of the latter, …etc. I.e. (They say: "If only a portent [: a cosmic miracle] be sent down on him from his Lord!" One of the signs, which Quraish, the tribe of Prophet Mohammed, asked for, was the cleavage of the moon, therefore God promised that it will occur in the Last Days, i.e. when the earth will stop its rotation around itself. Ø (We will show them Our portents [indicative of the truthfulness of Mohammed] on the horizons [of the sky]) means: the portents or the signs which have just been mentioned, like the fixation of Moon and its cleavage, and the other extraordinary events. Therefore, (and among themselves): This sign is the Mahdi or the Paraclete who will teach and guide them, and explain the Quranic revelations that are mysterious to them, so that the signs will be both scientific and practical; the sign of the Mehdi (or the Paraclete) is a scientific one; while the signs which will appear on the horizons will be practical. i.e. (in order that it will become evident to them that [the Quran] is the truth [from God and not from Mohammed]) means: until it will be clear to them that the Quran is revealed from God, and that Mohammed did not forge or invent it, as do some of them claim. · (I shall show you My portents) means: those signs which will appear in the last days or in the terminal of the Time; and they are the extraordinary events which have just been mentioned. We said that any hot object is attracting, and any cold object is attracted. However, the Earth at the present time is a hot object, even though its surface is cold, but the coldness of its surface is nothing in comparison with the heat of its core. Comets are flaming and fiery objects; therefore, there is no attraction between the Earth and the comets except very little. But, obviously, when the center of the Earth will become cold, it will be exposed [more] to the falling down of comets; because it will have become a cold object. Comets are fiery objects; so that whenever a comet comes and approaches towards the sky of the Earth, it will fall down upon it; because the comet will try to pull the Earth but it cannot; because the Earth is much bigger; so it will fall down upon it. This will be very dangerous and disastrous to the inhabitants of Earth on that day, and a large number of people will die because of the falling of comets down upon the Earth. By comets, and by the time and place at which they will fall down. >> (And it is surely an awesome oath, did you but know [that]) means: It will be a greatly dangerous event and a disastrous calamity, especially when you know what destruction and ruining it will cause; therefore, you have to believe and convert and you should abandon the worship of idols. The ‘falling down in adoration’, here, is the obedience and falling down upon the Earth. The ‘blast’ (or the ‘thunder-bolt’ or ‘calamity’), here, is some kind of ruining torment [that strikes them] like the cleavage, storm, earthquake and fire. I.e. (Do they seek [indeed] to hurry on Our punishment? they [: the stubborn disbelievers] will surely say: "What withholds it [from afflicting us]!?" >> (it will not be averted from them) means: It will not be driven away from them, as had it been driven away from the people of Nineveh [at the time of Prophet Jonah]; because the comets will fall down upon the earth on that day. It means: The comets, after falling on the earth, will be dipped down inside it. Therefore, those “that [now] slink [away from your sights!]" means: the comets because they, nowadays, are hiding from our eye-sight, while – before Doomsday – they will be swept into the earth; i.e. they will resort to the earth and disappear inside it. So comets are the opposite of meteorites; because meteorites remain on the surface of the earth after their falling upon it, while comets disappear inside it; because they are flaming and fiery objects. Their falling down will be on the side of the everlasting night and on the evening-glow zone; because these two zones will be cold, so the attraction will be between them and the comets more than the attraction with the side [or the hemisphere] of the everlasting day; because the heat causes a repelling between the earth and the comets. God – be exalted – swore by the everlasting night, which will appear when the earth will stop its axial rotation, and He swore by the evening-glow which is the region between the night and the day; that is because of the falling down of many comets upon them. Question 50 What is the meaning of His saying – be exalted – in the Quran, فَلا أُقْسِمُ i.e. (But no, I swear)? Why didn’t He say: I swear by the multiple falling down of the stars; for we did not hear, in the Arab language, such an oath, neither in their literature, nor even in their poetry? Answer: I shall give you a rule, by which you can know the oath mentioned in the Quran. The oath in the Quran divides into two groups: in present tense and in past tense; i.e. God – be celebrated His praise – swears once by an event happened in the past; while other times, He swears by an event that has not occurred yet, but which will take place later on. I.e. ([I swear] by the sky [of Nineveh] and [its] ‘night visitant’! The "star of sharp brilliancy"; God sent it on the people of Nineveh, when they did not believe. (2) The future [oath] While the second type is a threatening by a punishment event which will take place later on. This, also, is a threatening oath, which means: If you do not believe in Mohammed, then I will send on you some of the future chastisement that I have told you about. I.e. (No, but I [: God] swear by the Doomsday! This is a threatening oath and a promise by the occurrence of the torment in the future; because Doomsday has not come yet. I.e. ([I swear for the future] by the sun and the severe heat of its noon-time! I.e. ([I swear] by the night, when it shall enshroud [that region of the earth]! Therefore, these three Quranic revelations are some threatening oaths, by the occurrence of the chastisement in the future time. We said that the life of the Sun will come to an end, and its surface will cool in two thousand years – just as how had the Earth surface cooled when it had been a sun. At that time, it will become an earth like our Earth; and because its core will be still fiery, then the gases will continuously be emerging, but they will be prevented by the crust from escaping to the outside. For this reason, the Sun will burst and break up into nineteen pieces. This explosion may be preceded by several local explosions, which will be followed by the general explosion, which will break it up into nineteen pieces. That is because the cold crust, forming on the surface of the Sun, will initially be thin, so that the gases, collecting under this crust, will cause a local and limited explosion, which will cause a tear through which the gases will escape. Afterwards, another explosion will occur many years later, and another one moreover, until the crust will get thicker over the Sun surface. At that time, the explosion will be generalized, and the Sun will become several pieces. However, many local explosions occurred in the Sun. The explosion was equivalent to the explosion of one million Hydrogen bombs, and it led to the heavy bombardment of the earth with cosmic rays. Dr. Thomas Gold said in his declaration that the great increase of the cosmic rays started at 3: 45 A.M. G.M.T., and lasted for two hours. This increment of cosmic rays, to which Earth was exposed, is considered the greatest increase in history. Dr. Gold described the explosion to occur in an area much larger than that of the Earth globe, and that its power was beyond imagination. Afterwards, it was announced that another similar explosion occurred on 20th of May 1957. A bright light is usually emitted from such explosions, in addition to ultraviolet rays, Hertz rays and [other] particles thrown out of the Sun. Twenty hours following the explosion, the greatest magnetic storms took place on the Earth. The observatory of the research center of the American Air Force declared on 13/March/1959, that there occurred on that day an explosion on the surface of the Sun; for gases emerged from its center, with a very high temperature exceeding the imagination, with a speed of 3.5 million miles per hour. While Harvard Observatory announced that, as Dr. Donald Menzel the director of the observatory said, the explosion – that occurred in the Sun – had been recorded on many films with the aid of the Coronagraph, which is an instrument for recording the fire and light rays emitted from the Sun. With the aid of this instrument, it was discovered that the power of the explosion equaled the simultaneous explosion of 100 million Hydrogen bombs, which is one thousand times greater than the Earth gravitational force. Following that [generalized explosion], those pieces [of the broken up Sun] will be attracted towards the nearest sun, and orbit around it, then after elapsing of a long time, the surface of those pieces will completely cool, and they will be inhabited. This is how the life of suns will come to an end, so that they break up into new planets. It means: when it will be torn up into many globes; and this was interpreted on the past pages. It means: Upon it lies the burden of gravitating nineteen planets. I.e. (By no means, surely he will be thrust into [Hell] ‘that will break into several pieces'. And can you imagine that ‘which will break into several pieces'? It means: Hell is about to burst and break up because of the rage; ‘Hell’, actually, is the sun. The interpretation: Every material thing will disintegrate and vanish, save the ethereal; they are immortal, and will not die or break up. We said that the Sun will break up on Doomsday, and obviously if the Sun breaks up, then huge amounts of gases will emerge from it that will fill the atmospheres of the planets. In addition to that, there will emerge from it fire, flame and smoke that will fill the space; this fire will reach to the Earth and the rest of the planets, and that will afflict the souls remaining on the Earth; truly, they cannot be saved from it, that is because the Earth and the other planets will be nearer to the Sun; because their cores will become cold, as it was explained in the past pages. Therefore, the "smoke" is that which will emerge from the Sun when it will break up, and this smoke will be a mixture of seven gases. The شواظ is the flame of the fire, this fire which will emerge out of the broken up Sun. The نحاس is the lava and molten metals and liquids that will emerge from the Sun after its explosion. The word نحاس is derived from the word نحس i.e. misfortune and misfortunate as a singular; the plural is نَحِسَات i.e. unfortunate days. We said in the past pages that the life of the Sun will come to an end, and its surface will become cold, then the gases emerging from it will remain imprisoned inside its core, and there will be no exit for these gases to get out; then when the gases will increase and accumulate in its core, [they will build an increasing pressure] and the gases will press on the cold layer which will crack and the gases will start to escape, making a great sound, like that of the [old vapor] train, when they open its vapor valve. That great sound will continue till the influence of the gases emerging from the site near to that crack will lessen, when the sound will be faint. This will be followed by the rushing of the gases – present inside the core of the Sun – towards that exit to get out through it; for they will have found an exit; the exit will enlarge by their rushing out through it. By this time, they will have caused a sound louder and greater than the initial one, and this sound will go on until the Sun will burst and break up into nineteen pieces. Obviously, this event will cause a great disharmony in the solar system as a whole; because the Sun is the mother of the planets and it is their attracting object; so that when it will break up, its gravitation will fail to hold the planets, which will slip away and scatter in the space. When this event will take place, the Earth and the rest of the planets will start to tremble and quake. At that time, a great fear and horror will overwhelm their inhabitants, until the Earth will break up and people die; so they [: their souls] will leave it, and souls will ascend through the space to the place of the congregation of souls, and none will remain upon its surface. As such will the rest of the planets be, and their inhabitants will be like the Earth inhabitants. And if they were to escape [the gravity of the sun], no one else than He could hold them. >> (And if they were to escape [the gravity of the sun]) on Doomsday. It means: And if they were to slip away or escape the gravity [of the sun], then can anyone, other than God, hold them back? >> (no one else than He could hold them); because even though the planets will break up, they will not disappear into the space, but will become meteorites attracted to the new planets. The ‘horn’ is the cold layer that will form upon the Sun surface, and the blowing will be from its core, and it is the gases, rushing out through the exit or the crack, that will blow in the horn; i.e. the cold crust that will form on the Sun. >> (and all who are in the heavens) means: the gaseous layers which are the dwelling place of ‘genies’. >> (and all who are in the earth) The ‘earth’, here, means: all of them. It means: Each of ‘genies’ and ‘human beings’ will come to Him obedient and yielding. I.e. (And the 'Horn' will be blown, so those [genies] in the [gaseous] heavens and those [humans] in the earth will be [thunder] stricken, save [those angels, prophets and righteous men] whom God pleases. >> (so those [genies] in the [gaseous] heavens and those [humans] in the earth will be [thunder] stricken) means: a fire will afflict them, so they will die. The ‘heavens’, here, means the gaseous layers; the ‘earth’ means all of them [or all the earths: all the planets.] The explanation: Those inhabiting the gaseous heavens and those inhabiting the planets will be afflicted by fire, so that they will die. >> (save [the angels, the prophets and the righteous] whom God pleases); here God – be exalted – made an exception, i.e. the angels, the prophets and the righteous, who will not be afflicted by that fire or calamity. >> (Then it will be blown again, and behold, they will be standing up, waiting [for judgment and requital.]) It means: They will be awaiting the payment and recompense of their deeds and conduct. So ‘they’, here, is related to the souls. The interpretation: Then their souls will be taken out of their bodies, and they will be awaiting the judgment for their deeds. Therefore, in the first blowing, people will have a great fear and will be afflicted by a fire, while in the second, they will die and their souls will be gathered- together for the Judgment. I.e. (So when the 'Horn' is blown with one blast. >> (with one blast): this is because the blowing will be continuous from the Sun, so that the two blows as if they are one blow; because the first blow is continuous along with the second. I.e. (And when the ‘percussion [surface: the Horn’] is percussed. The النَّاقُور is the horn, and the sound that will come out of it is by the blowing of the gases through it. I.e. (And the earth [together] with the mountains are borne, and crushed with one crash) means: They will simultaneously break up. The interpretation: The planets and the mountains will be broken up and destroyed at the same time. Some people say that the ‘Horn’, here, is the trumpet into which the angel Israfel will blow on Doomsday, so that a very great and loud sound will come out, which people will hear and gather around him! I say that these words are not correct, and Muslims, actually, quoted them from Jews. There are no trumpets for angels to blow into them; because angels are ethereal; and ethereal creatures cannot blow into trumpets. Now suppose that we bring the biggest trumpet in the earth, and we put this trumpet at Baghdad [the capital city in the middle of Iraq], and we blow into it; then are the people of Mosul [a big city in the north of Iraq] or Basra [ a big city in the south of Iraq] going to hear it? The answer is: no. After the surface of the Sun will have cracked, and the sound will have issued, then the Earth will start its trembling and quaking until it will break up. I.e. (O mankind, guard yourselves against your Lord’[s punishment]; [for certainly] the earthquake of the Hour is a tremendous event. When the earth shall be violently quaked! Here, God – be exalted – has told about the calamities of the Day of Doom, and what will take place at that time of cosmic disturbances and the fear and horror; so that every pregnant woman in the planets will be scared away from her baby and will not pay attention to him; that is because of the fear and torment that will afflict her; so that she will be concerned with herself rather than anyone else, and every pregnant woman will abort her fetus; that is because of the suffering and torment afflicting them. >> (and you [man] will see men [afflicted with the earthquake] drunken) because of the extreme terror and pain. As regards the inhabitants of Earth, they will die before Doomsday, and that will be after the standstill of the Earth from its axial rotation, and no alive being will survive, save some inhabitants of the evening-glow (or the sun-set redness) zone. But as regards the planets that are bigger than our Earth, some alive beings will survive [till Doomsday]; because these planets will keep up their axial rotation till Doomsday when they will be afflicted, together with the Earth, by trembling and quaking initially, and later by destruction and breaking up. The interpretation: The planets together with their mountains will tremble and quake. It means: The second calamity will follow and come after it, which is the breaking up of the Earth. The first is the Earthquake, and the second is its breaking up and the dispersion of its parts into the space. 2. None can tell that its occurrence is a lie. 4. When the earth will be shaken with [severe] shaking. 5. And the mountains will be crumbled with fine crumbling. The ‘inevitable event’ which will take place on that day is the breaking up of the solar system. This means: It depresses one object and elevates another one; i.e. it will disturb the order and harmony, and make it upside down; because it will break the Sun up into planets, and break up the planets into meteorites, and smash the meteorites into dust and so on. It means: when the earth will vigorously quake. It means: and will become dust scattered upon the Earth. [“26- In the beginning, O Lord, You founded the earth: and the heavens are the works of Your hands. 27- They shall perish but You remain: and all of them shall grow old like a garment: And as a vesture You shall change them, and they shall be changed. We said, in the past pages, that when the attracted object loses its gravitational power, it will cleave and break up. We said also that the life of the Sun will come to an end, and it will tear up on Doomsday. Then, evidently, its parts will scatter in the space, and the order will be disturbed, then its gravitational [influence] upon the planets will be lost. In such condition, the present planets will be destroyed and broken up, and will be dispersed in the space in the form of meteorites, just like the meteorites present nowadays; they had – previously – been planets in the ancient times, but after their Doomsday they broke up into meteorites. When the heaven shall split open. The ‘planets’ means, in particular, the planets of the solar system; for the word كوكب in Arabic means a wandering star or a planet. The interpretation: When the planets will be broken up, and their pieces will be scattered and dispersed in the space. So God – be exalted – described the earth by the cleaving or breaking up. The interpretation: It was cleft or broken up in the ancient times and become nine pieces, after being one mass, and it will cleave or break up, on Doomsday, and become many pieces or fragments scattered in the space. I.e. (So when the ‘Horn’ is blown with one blast. And the earth [together] with the mountains shall be borne, and crushed with one crash. It means: God caused the mountain to break up and to be smashed. I.e. (Not at all; but when the earth is demolished and become many pieces. The خَسْف in Arabic means the cleavage, and it is the calamity which afflicts the object, so that it will destroy or degrade it. The مَوْر in Arabic means the rolling or waving to and fro. The interpretation: Have you taken security from Him Who is in the heaven: He is God – be highly exalted and be celebrated His praise – that He may not cleave and tear up the Earth with you, so that its parts will roll about or move about in the space, i.e. they will float and swim in the space; because they will become meteorites. So, God – be exalted and glorified – explained that He had created the planets, and dated for them an appointed time, and that their lives will not be forever. “26- In the beginning, O Lord, You founded the earth: and the heavens are the works of Your hands. So He will leave it as a level plain. The Arabic word قاع means an area of land. We said, in the preceding pages, that the Earth will stop its axial rotation, so that in one side there will be an everlasting day, while in the other side there will be an everlasting night. Obviously, the side facing the Sun will have severe heat sufficient to burn out and smash stones and rocks; because most of rocks are formed from calcium carbonate; therefore, if they are heated, carbon dioxide gas will emerge from them, and calcium oxide – which is a white powder – will remain. Secondly: the falling down of the comets – prior to Doomsday – upon the mountains will lead to their melting away and smashing. Thirdly: the heat inside the Earth core will diminish gradually, and will put off in the course of time; and by that the parts of the mountains and rocks become fragmented and disintegrated; because the gravitational power will have been finished inside the Earth core. That is because “the sole cause in the formation of the gravitational force is the heat”; for this reason, the mountains will become as sand-hills and become face to face with the factors of denudation and erosion; because the wind will carry away and scatter the dust towards the seas and oceans, and by that the Earth will become wasteland or desolate area where you cannot see any waviness or elevation. This condition will issue before Doomsday and after the standstill of the Earth from its axial rotation. While on Doomsday, the Earth will break up into meteorites. It means: like sand-hills in which the sand easily sweeps away of their sides with the least movement, and the wind carries it away to the low lands. It means: their parts will not be firmly coherent to each other, so that they will be like the fluffy wool. I.e. (The day when people will be like scattered moths. It means: The wind will carry away their dust, and scatter it towards low lands; because their parts will not be firmly holding together; that is because the Earth will then have lost its power of gravity. We said, in the past pages, that the word ‘sky’ or ‘heaven’, in singular, mentioned in the Quran, means the gaseous layers. These layers, too, are going to be ruined, that is because the Earth will break up on Doomsday; and as are the gaseous layers attracted now to the Earth, they will be destroyed and dispersed together with it. In other words, the gaseous layers will mix with each other, becoming smoke; as was it at the beginning of its formation. the ‘sijill’ is a big bucket made of leather; originally it was used for taking water from the well, but after being perforated it was used for keeping their books. And because there was no paper at that time, their books were made of leather, gazelle skin i.e. parchment, broad bones, pieces of wood …etc. The ‘rolling up’ means the decrease of power, and the regression in various aspects, and the disintegration of masses. The ‘books’ is the plural of ‘book’. The ‘book’ is the paper or anything containing the written words. [The Arabic word, lit., is similar to the word ‘writing’.] Books of ancient Arabs were written on bones of animals like the shoulder blade …etc., or on palm leaves or on lime stone, or pebbles, or on the cattle leather, or the parchment which is the skin of the gazelle. The interpretation of this Quranic revelation: The day when We will destroy the gaseous layers and mix them with each other, exactly as does your folder or briefcase (i.e. the ‘sijill’) mix the books (or writings) over each other and with each other. It means: As had We started the formation of the gaseous layers from smoke, as such shall We return them into smoke on Doomsday. This is a promise from God Almighty, and He – be exalted – mentioned that in the past tense [as the Quranic revelation indicates] to suggest that He had carried out a similar thing, to those who were before them, when their Doomsday took place, and We had torn up and destroyed those gaseous heavens which had been above them. And as such will We do when Doomsday of your Earth will take place. Therefore, (the [sky] will be shabby) indicates that it will be torn. The ‘sky’, here, means the gaseous layers. The وَرْدَة is an indication of coming of the souls to the ‘gathering-together’ in heaven. The دِهان is the plural of دهن which is a pit present between the mountains in which rain water collects. It means: The souls will gather in heaven for Judgment, just as how does rain water collect in the pits between mountains. The interpretation: The sky on that day will be like the turbid sesame oil; because those gases will mix and become like smoke. I.e. (Then, if you disbelieve [in the Quran], how will you avoid [the chastisement of] a day that shall turn children grey-headed? It means: parted, i.e. split and opened. It means: It will return again to be smoke, just as how it was at the start of its formation. The ‘heavens’, here, means the gaseous layers. except that in the first aya ‘the heavens’ is mentioned in plural, while in the second it is mentioned in singular, but in both Quranic revelations God – be exalted – means the gaseous heavens and their splitting and destruction on Doomsday. The interpretation: The gaseous heavens are about to crack or split; because of their serious saying when they ascribed a son [or daughters] to the Most Gracious, and the earth is about to split or cleave, while the mountains are about to fall down crushed and dispersed. So these Quranic revelations tell clearly that the gaseous layers will split and disperse on the Day of Doom; because the Earth will break up and the gases – being attracted to it by gravitation – will be destroyed altogether with the Earth. and the mountains will be smashed into scattered dust. It is the day in which all the material creatures will die, so that none will survive on the surface of the Earth and the other planets. then the souls will leave the Earth and scatter in the space, while nothing will remain on the destroyed Earth except dead corpses. On that day, the ‘gathering-together’ or the ‘congregation’, the Judgment, the recompense and the admission into Paradise or hell for all people. It means: At that time, Doomsday will take place; and on that day, it will be blown through the Horn with one blast; and on that day, the Earth and the mountains will be crushed and destroyed. It means: It will split up and part off the souls; because the souls will be inside the Earth, i.e. inside the graves. · (that the earth were rearranged and leveled with them) means: They wish that the earth will return as it was [before its splitting and breaking up], so that it will compact and reunite after its splitting, so they may disappear inside it, just as how were they hiding in their graves; and they wish there will neither be any gathering-together nor any judgment. But when the Earth will split and they will become without refuge, and will see the gathering-together and the Judgment; at that time they will wish such a wishing. The word تُسَوَّى i.e. (were rearranged and leveled) means: Its parts stick to each other and reunite after its breaking up. The interpretation: When that which We have mentioned: the breaking of the sun into many spheres, the falling down of the comets, or the disappearance of the planets from sight because of the thick smoke and fog in the atmosphere, and the moving of the mountains; at that time, Doomsday will take place. These Quranic revelations have been interpreted in the past pages. The interpretation: When these events will take place, then that day will be the Day of Doom. When the sky [: the gaseous layers] shall tear apart. The interpretation: When these events will take place, then that day will be the Doomsday, and on that day the Judgment and the Recompense will be. >> (And cast out all that inside it [of evil souls], and be void [of them.]) means: It will throw, what souls inside it, to the space, and will be devoid of them. And earth shall expel its burdensome [insufferable, wicked souls]! And man shall say b [on that day]: "What is the matter with it!?" The interpretation: When these events take place, then that day will be the Doomsday. >> (And earth shall expel its burdensome [insufferable, wicked souls]!) The heavy persons are the wicked souls; it means: It will drive the souls, which were heavy upon the earth, out of it. And when the sky [: the atmosphere] will be riven apart. It means: What you are promised with, concerning the Judgment and Requital, is going to take place. I.e. (But man aims [from his denying the sending of souls to the Next Life] to go on as a profligate. He questions [with denial]: "When will Doomsday take place!?" So when the sight becomes dazed. On that day, [the denying] man shall say: "Where to flee [from the chastisement and punishment?]" On that day, the [only] ‘repose and settlement’ will be in the neighborhood of your Lord. The interpretation: When these signs are there, then the Doomsday will be; because Quraish, the tribe of Prophet Mohammed - salam to him – asked about Doomsday: when it will be; so God – be exalted and glorified – answered them with these Quranic revelations. Obviously, these pieces will not be equal in volume, but some of them will be small while some others will be big. In addition, they will not be spherical in shape at the start, but they will have some projections and edges. Therefore, when these objects will start to rotate around themselves because of their central heat, then the edges and peripheral projections will detach from them forming their moons. By that, the original pieces will become spherical; because the projections will have been detached from them. Then they will increase in coldness and firmness until they will become inhabited planets. First: Their surfaces will become completely cold, in the course of time. Second: They will draw towards them our present planets; for they will have been broken up, on Doomsday, into meteorites; some of which will fall on those new planets. Third: They will draw towards them the scattered particles in the space, which – previously – were meteorites that have been smashed when their Doomsday occurred. Fourth: They will draw towards them the gases scattered in the space. By means of all these factors, their volumes will increase, and they will become the new planets orbiting around a new sun, and they will have some new moons. In other words, there will be a new solar system, and God will create on them plants, animals, people and so on. And as such are the solar systems formed: Any solar system that is destroyed, another one will issue instead of the previous one. I.e. (O people, it is you that are in need of God, while God is not in need of [any], and is the All-Laudable. If He please He will make you perish [by death], and will bring [instead of you] a new creation. Recently, a very severe heat wave has overwhelmed the whole world, in which the temperature and humidity have arisen in an extraordinary way, and we do not remember any heat wave similar to it. One who studies the temperature in summer, especially in Iraq [our country], will find that it did not rise to such an extent that it exceeded half the boiling temperature by more than one degree which became very embarrassing to people and harmful to their health. I think that this is ascribed to that the Earth has approached the Sun by few miles, according to what we explained under the title of The earth approaches the sun in this book, in which we said that the heat of the Earth core should have decreased to less than its previous severity because of the emergence of fire and lava from volcanoes, and because of the utilization of the petroleum and the natural gas in huge amounts. And due to the fact that the gravitational force affects the cold object more; therefore, the gravitational force of the Sun should have influenced the Earth more than previously, so that the Earth has approached the Sun in this year 1978 AD, so that the heat increased on the surface of the Earth. If the heat in the following summer seasons will reach to such an extent, like that during this year, then that will confirm our hypothesis of the Earth approaching and getting nearer to the Sun, and if not then our hypothesis will not be correct. [In the years following 1978, the heat continued to be high in Iraq and some other countries, so that the winter was warmer and summer was hotter than before, as was anticipated by the late Mohammed-Ali Hassan Al-Hilly, the interpreter of the Quran and the Bible. With God’s help, we have completed the first part of our book; its title is The Universe and the Quran. The second part, entitled Man after Death, will follow, by God’ will. Not on the web yet. 1- The Koran (QUR’ÁN) … Translated by E. H. Palmer. 3- The Glorious Kur’an .. Translation and Commentary - by Abdallah Yousuf Ali. 7- The Koran interpreted – by A. J. Arberry. 12 – The Holy Bible – many versions. 13- Oxford Advanced Learner’s Dictionary. 14- Merriam- Webster Collegiate English Dictionary. 15- A Dictionary of Modern Written Arabic – Hans Wehr .. Edited by J. Milton Cowan. 16- Al-Mawrid (English-Arabic & Arabic-English Dictionary)- by Munir & Dr Rohi Baalabaky. The ‘night’ means that long night; and (when it retires) means: when it will withdraw from you, so that it will never return to you again, but instead the day will be everlasting for you, so that you will die from its heat, and the ‘morning’ means that long day. From which the day light will result. It means: That everlasting night will round up or collect the living creatures; because they will run away from the heat of the day-side. i.e. the Last Day which no day will follow. The soul of Prophet Mohammed - salam to him – will be in the outer space, in the heavens; he will look to the Earth, and see it conspicuous, as a whole, circulating in the space around the Sun. It means: a sign or a portent of the approach of the Day of Judgment; it is the cleavage of the Moon. i.e. We too are waiting for your death in order to punish you, so which of us has a nearer hour of death. i.e. the terminal period of the World, that is before Doomsday. [The censuring soul means the ‘Paraclete’, mentioned in the Gospel, who will convince the world of sin and of justice and of judgment. “7- But I tell you the truth: it is expedient to you that I go. For if I go not, the Paraclete will not come to you; but if I go, I will send him to you. i.e. when the sun shall be ‘divided into many spheres’; at that time, Doomsday will take place. i.e. which is the sound of the flame and the emerging out of gases. It boils with its contained liquids. The Arabic word indicates the sound of its boiling. the true promise of destruction and ruining on Doomsday. i.e. a violent wind with roaring sound. i.e. from above the planets; because each planet has its own gaseous heavens; and that cleavage is because of their serious claim that God has a son (or daughters!) Those were the old pagan Arabs in the pre-Islam era who claimed that the angels were God’s daughters, and Christians who claim that the Christ is the son of God! to destroy and disperse them.